Here are 21 key terms that most often get bandied about. 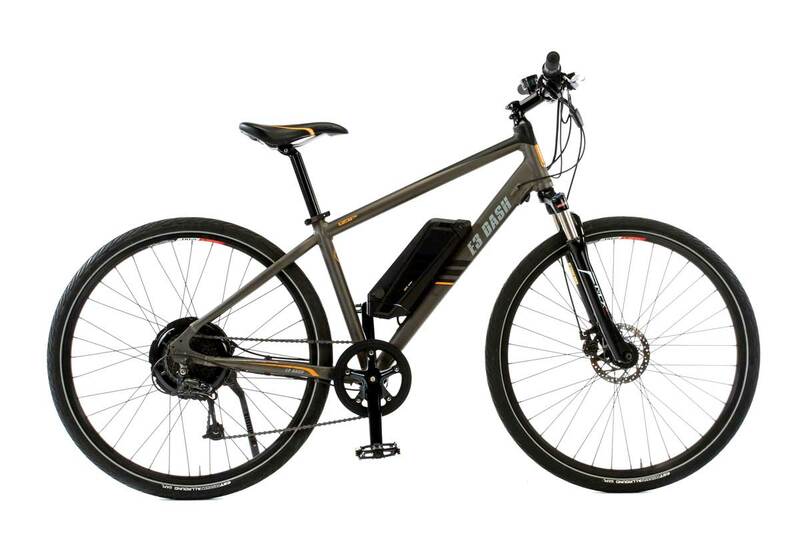 POD (Power on demand): On an e-bike with POD control, the speed of the motor is controlled only by a throttle. The rider may still pedal, but it is not required to pedal to activate the motor. PAS (Pedal assist): In contrast to POD mode, pedaling activates the motor. Some systems sense torque and increase aid as you increase effort. With PAS, there is no need to use the throttle, though some systems allow the throttle to work as an override when you want full power. Newton meter (defined in e-bike terms): A unit of torque in the SI Units (International System of Units, a complete metric system of units of measurement for scientists) system. Used to measure and rate the rotating force produced by an e-bike motor. The most important factor in determining how well a motor will climb hills and accelerate. Sealed Lead Acid (SLA): SLA batteries are mostly found in older e-bikes. SLA is still considered a large step up from ordinary lead-acid batteries in automotive and powersports equipment, since the “sealed” battery allows freedom to mount the battery without regard to orientation or worry about acid leaking out. 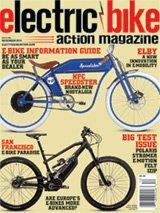 Heavy (we are talking lead, after all) and lacking the energy density of newer chemistries, they were widely used in early e-bikes because of their low cost, easy system integration and ability to deliver the high current e-bike motors require. Watt: A unit of power in the SI system. Used to measure and rate the capacity of an e-bike motor to do work. A motor that is consuming more watts generally feels more powerful and usually reaches higher speeds. Watt hour (Wh): A measurement of electric charge. Watt hours rate a battery’s energy content. A watt hour is the amount of work required to produce one watt of power for one hour. When used to rate the capacity of e-bike batteries, watt hours are generally derived from the battery’s nominal voltage multiplied by its capacity in amp hours. This measurement is useful because it allows easy comparison of the energy content of several batteries, irrespective of voltage: a 36-volt, 10Ah battery would be labeled 360Wh; a 48-volt, 7.5Ah battery would also be labeled 360Wh. Volt: A unit of electric potential in the SI system. Production e-bikes generally run at 36 or 48 volts. In general, higher voltage means better electrical efficiency. Amp: An amp, or ampere, is a unit of current in the SI system. Amps measure the amount of charge flowing in an electrical system. Amp hour (Ah): A measurement of electric charge. An amp hour is the charge transported by a constant current of one ampere for one hour. A battery with a capacity of 10 amp hours can theoretically supply a constant current of one amp for 10 hours, two amps for five hours, and so on. Throttle: A handlebar control similar to that found on motorcycles or scooters, it is used to vary the speed of the motor. E-bike throttles are usually twist-grip, thumb-lever or push-button types. Brushless: Conventional electric motors have a rotating armature wrapped with wound copper-wire coils. The armature and windings generally rotate inside a case with fixed magnets. These motors use brushes to conduct current between stationary wires and the rotating shaft. A brushless motor is constructed in reverse. The copper-wire coils are fixed and the magnets rotate. The brushless motor does not need brushes (no wear and no dust from the worn brushes to contaminate the engine), but it does require controller circuitry to operate. Hub motor: A motor that is incorporated into the hub of a wheel and drives it directly. The hub motor’s axle is held fixed in either the front or rear dropouts, and its shell is spun by internal electronics. Most modern electric bikes use hub motors. Direct-drive hub motor: The simplest type of hub motor. The magnets are fixed on the inside surface of the hub, and the windings are permanently attached to the axle. When power is applied, the hub is made to rotate around the axle. The advantages of a direct-drive hub motor include quiet (often silent) operation, few moving parts, and the ability to regenerate power into the battery (because the magnets are always moving over the coils). However, because the motor is always mechanically engaged, there is “cogging,” a drag that can be felt while coasting. Direct-drive motors must also be larger (and usually heavier) than comparable geared hub motors to achieve the same performance. Regenerative braking: Sometimes referred to as “regen,”direct-drive hub motors are capable of recovering a small amount of energy back into the battery while the bike is coasting. When active, the motor’s drag on the wheel increases markedly. Geared hub motor: These are hub motors built with internal planetary reduction gearing. In contrast to direct-drive motors, they can be smaller, more efficient and produce more torque. Geared hub motors are mechanically disengaged from the bicycle wheel when not powered, so they avoid the coasting drag experienced with direct-drive motors. These advantages come at a price; geared hub motors are more expensive, can be noisy (for electric, but still very quiet compared to any internal combustion system) and have moving parts that can wear out. Front drive: A front-drive bike has the hub motor in the front wheel. This is rarely used on production e-bikes, but is quite common for conversion kits. Rear drive: A rear-drive bike has the hub motor in the rear wheel. The vast majority of production e-bikes with hub motors are rear drive. Center drive: A center-drive bike mounts the motor or drive unit in the center part of the bike’s frame. The most modern center-drive units supply power to the bicycle chain, so the motor gains the advantage of any available gear options from the rear cassette and derailleur. Controller: The “brain” of an e-bike. Typically, the controller acts as a smart connection between the other components on the bike: motor, battery, throttle (if applicable) and the pedal assist. Pedelec: A chiefly European term meaning an e-bike with only a pedal-assist function and a speed limit of 25 km/h.